Green Hollow Center, Loess Hills in Southwest Iowa, Development and Preservation | William Blackburn Consulting, Ltd.
provide a learning environment for examining sustainability—the balance of environmental, economic and social concerns needed to provide long term well-being for individuals, organizations and society as a whole. The center was formally launched in 2009 with the public Hills & Heritage Festival, featuring experts on wildlife, archeology, native plants, and local history who provided on-site lectures and tours to some 400 visitors. 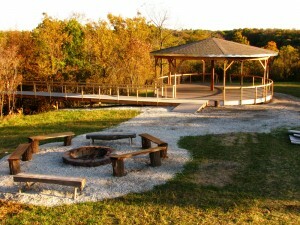 It hosts a nonprofit Loess Hills Music Festival (www.loesshillsfestival.com ) in September of odd years.